The nutritious almonds we eat1 grow in a shell, protected by a hull, on a tree. The trees store carbon and are transformed into electricity at the end of their lives, the shells become livestock bedding, and the hulls are used as dairy feed. Nothing goes to waste. California Almond farmers and processors have always taken responsibility for these co-products—the hulls, shells and trees—getting the most out of the resources used to grow almonds and ensuring they’re put to beneficial use rather than sent to landfill. A changing market for these materials has led the California Almond community to focus research investment on new uses, embracing a zero-waste approach to ensure everything our almond orchards grow is used while addressing needs across multiple industries such as food, pharmaceuticals and automotive. Almond trees capture and store a significant amount of carbon over their 25-year life cycle, and using the trees’ hulls, shells and woody biomass is key to reducing carbon emissions and environmental impact. 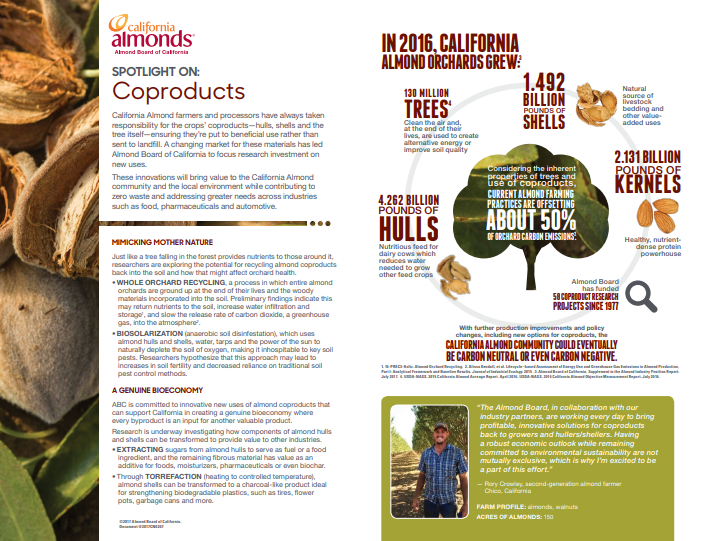 Considering the inherent properties of trees and current uses of almond co-products, almond farming practices are offsetting about 50% of their carbon emissions.2 With further production improvements and policy changes, the California Almond community could eventually be carbon neutral, or even carbon negative. Almond Board of California is committed to new uses of almond co-products that can support California in creating a genuine bio-economy where every byproduct is an input for another valuable product. Research is underway to investigate how components of almond hulls and shells can be transformed to provide value to other industries. Just as when you transform a raw egg into a plate of scrambled eggs for breakfast, by changing the properties of co-products using heat, fermentation, extraction and other processes, their components become valuable for alternative uses. Current research is exploring using almond hull and shell components as a growing medium for mushroom cultivation, producing feed sources for poultry and aquaculture, as well as plastic additives for strength and colour, soil amendments for almonds and other crops, supplemental winter food sources for honey bees—and even for brewing beer. Healthy soils are vital to backyard gardens and almond orchards alike. Just as a tree falling in the forest provides nutrients to those around it, researchers are working on projects, funded by Almond Board of California and the almond community, to explore the potential for recycling almond co-products back into the soil and how that might affect orchard health.